Try our lighter take on the classic Italian seafood and pasta dish featuring lemon, butter, and plenty of garlic. Prefer chicken to shrimp? Great! Just replace the shrimp with chunks of chicken breast and follow same directions, adjusting cooking time for chicken, depending on how large you cut the pieces. Per Serving: 316 calories; 12g fat; 21.5g carbohydrates; 30g protein; 263mg cholesterol; 1100mg sodium. the only fat in this entire recipe is the 3 tablespoons of butter than get divided between FOUR generous portions. such a winner in my house when we feel like eating something indulgent, but don't want to be weighed down all night by heavy creamy sauces. delicious, light, and wonderful! This shrimp scampi is my absolute favorite! It's so simple to make, I added it to my weekly rotation. My husband and I both love all the garlic and red pepper! I wouldn't change a thing about this dish, it's perfection! 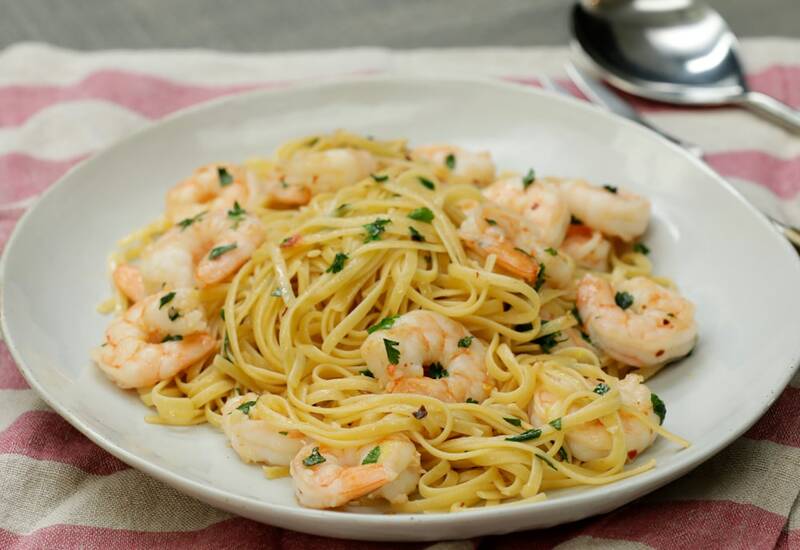 I used angel hair pasta and added pine nuts to this delicious scampi! I also skipped the parmesan cheese at the end. You can't even tell the amount of butter was reduced, it's perfect. I did 4 garlic cloves and 1 tablespoon of butter and was completely happy with the results. I also added a tablespoon of white wine, which I think is a must! This was perfect. We used really large jumbo shrimp from the fresh seafood market. Do yourself a favor and don't be shy about using lemon and red pepper flakes! We doubled both and it was bursting with flavor. So good!